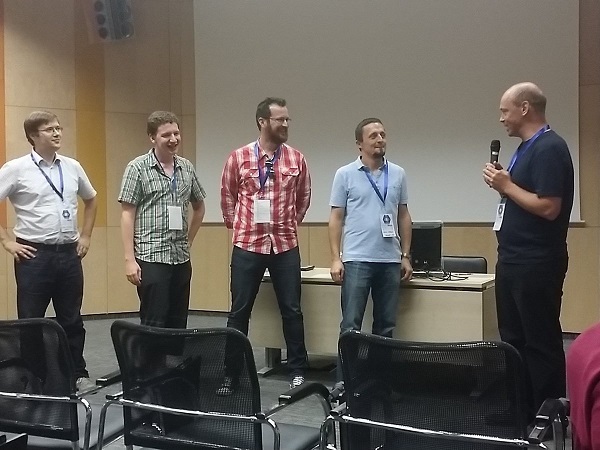 ﻿ Quanopt team wins Data Visualization Challenge @ first satRday conference | Quanopt Kft. As part of the conference program Data visualization challenge was announced. The challenge rules were quite simple: a dataset was published consisting of 18K+ entries on the flights of the Budapest Liszt Ferenc airport, sourced from the Hungarian Central Statistic Office. The participants were asked to submit a data visualization created from the data using only R.
Quanopt team won the first price based on the conference audience voting. Our Shiny app can be found here: results, code.